The Ministry of Education on Monday unveiled a draft version of the controversial state-authored history textbooks, despite criticism over their political neutrality and nationwide protests against their initiator President Park Geun-hye. The ministry and National Institute of Korean History revealed three history textbooks for middle school and high school students, called the “Correct History Textbook,” which they said were designed to assert the country’s legitimacy and remove political bias. “We developed these textbooks to help our students gain a balanced view on the country and its history without leaning toward any particular ideology,” said Education Minister Lee Jun-sik during a press briefing at Seoul Government Complex. “It is difficult to anticipate a bright future if students doubt the legitimacy of the country without feeling proud of our history,” he said, adding that existing textbooks issued by private publishers have been biased. But the official introduction of state-issued textbooks next March is likely to face a tough road ahead in the face of massive rallies against the scandal-hit President Park and her signature policies. Following the unveiling of the book, civic groups heavily criticized the textbook for “beautifying” dictators, including President Park Geun-hye’s late father and former president Park Chung-hee, and their economy-focused policies. The government, which has refused to reveal the full list of writers, released the names of 31 of 46 writers for the history textbook. The move is likely to further stoke dispute as it included mostly right-wing scholars and teachers left-wing scholars accused of justifying pro-Japanese activities during the colonial era and glorifying dictatorships. “Prominent scholars, experts and teachers in the field participated in producing the textbooks to base it on historical facts and constitutional values,” the ministry said. A third of the writing staff are from state-run organizations. Four out of seven writers of Korean modern history belong to neo-conservative organizations. There is not a single scholar who majored in modern history among them. The new textbooks cover some of the most disputed parts of the nation’s history, from its foundation through its depiction of economic achievement by former dictators to the pro-democracy movement. The reinstatement of state-issued history textbooks has sparked resistance from who opponents who claim Park is attempting to rewrite history. In the revised version, the textbooks describe South Korea as being founded on Aug. 15, 1948 -- three years after Korea’s liberation from Japan’s 1910-1945 colonial rule. That is the day of “foundation of the Republic of Korea,” or South Korea, instead of the “establishment of the ROK government,” according to the books. Right-wing politicians and historians see the country as having been officially launched in 1948 by former President Syngman Rhee. Leftists, on the other hand, say the country was established in Shanghai in 1919 in the form of the government-in-exile to fight against Japan. They accuse the new state-authored history books of undermining the independence fighters’ activities to win independence from Japanese colonial rule. The ministry also said that it stressed North Korea’s human rights violations, military provocations, nuclear development and how its leader Kim Jong-un uses its self-reliance ideology to justify its regime. The “establishment of the Democratic People’s Republic of Korea,” or North Korea, was revised to the “establishment of the North Korean government,” the ministry said. It also stipulated that the 1950-1953 Korean War was sparked by North Korea’s invasion on June 25, 1950. The government had criticized some privately published history textbooks for claiming both countries shared blame for the war. The government announced its plan to revise the current textbook publication system in October last year, criticizing the previous textbooks for being biased against leftists and highlighting the need for “balanced” state-authored history books. 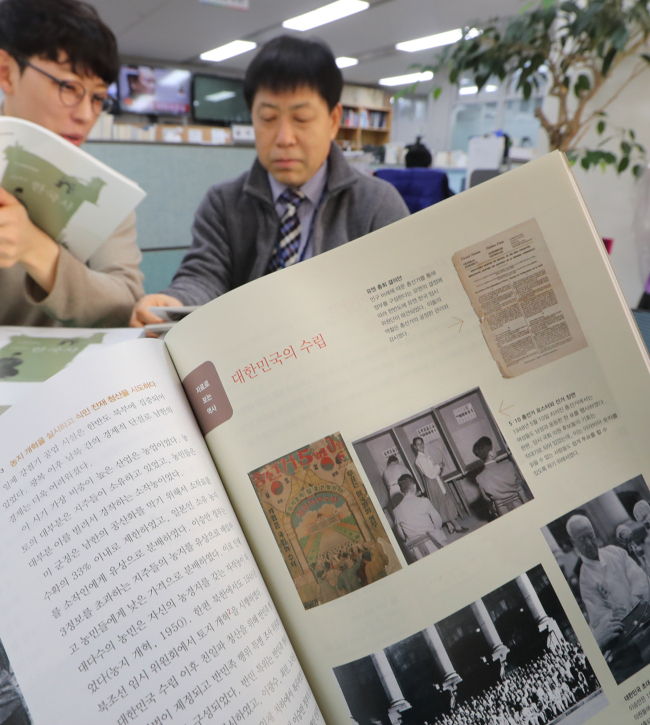 The ministry plans to make public the draft version and receive feedback from experts and the public by Dec. 23, by releasing the textbooks in e-book form at http://historytextbook.moe.go.kr. Taking into account the opinions, the final version will be confirmed in late January next year, the ministry said. The final version of the history textbook is slated to be used at middle and high schools nationwide starting from the next semester, which begins in March. Lee dismissed speculation that the ministry is considering delaying the introduction of the textbooks or allowing both state-authored and privately published books to be used at schools in the wake of the massive anti-government protests. “We are going to adopt the state-authored textbook as planned. We don’t consider at all scrapping it, but we review ways for schools to better use them in the field,” Lee said.